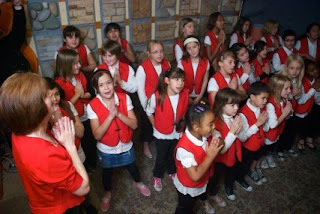 The chorus from Holladay Intermediate Magnet School joined us to perform some holiday tunes on Tuesday morning. We will re-air their performance at 5:30pm Wednesday on The Home Stretch. The students will also perform Saturday at The Screening Room downtown (6:30pm) as part of 2nd Saturdays Downtown. The students sounded wonderful. Thank you for hosting! What an awesome opportunity for the Holladay Choir. I can't wait to see them at the Screening Room on 2nd Sat Night downtown! They sound great! Thank you KXCI for giving them an experience they will not soon forget!